It’s a Charmed Life – Part 1 | Oh, for the Love of Vintage! As the title suggests, this post is about my love for vintage charms and charm bracelets. I have a number of them in my collection and continue to add vintage charms. I love wearing my vintage charm bracelets as they represent history and certainly are a conversation starter. What I mean by ‘represent history’ is two-fold. One, charm bracelets have endured long throughout history and each bracelet represent a particular time period. Two, when one wears a vintage charm bracelet you’re actually wearing someone’s personal history. To me, that’s fascinating! Every charm on a 1950s bracelet that I wear was hand-picked by some woman of that era. I often wonder who she was, what she was like, what happened to her? I digress, so let’s move on. Charm bracelets can be traced back to around 500 to 400 B.C. At that time, the bracelets were worn for religious, spiritual or magical reasons. It wasn’t until the mid-to-late 1800s that charm bracelets were worn solely for fashion. Queen Victoria was key in making charm bracelets popular in the late 1800s. Apparently she loved wearing them and giving them as presents. When Prince Albert died in 1861, she started a new trend, ‘mourning’ charms. 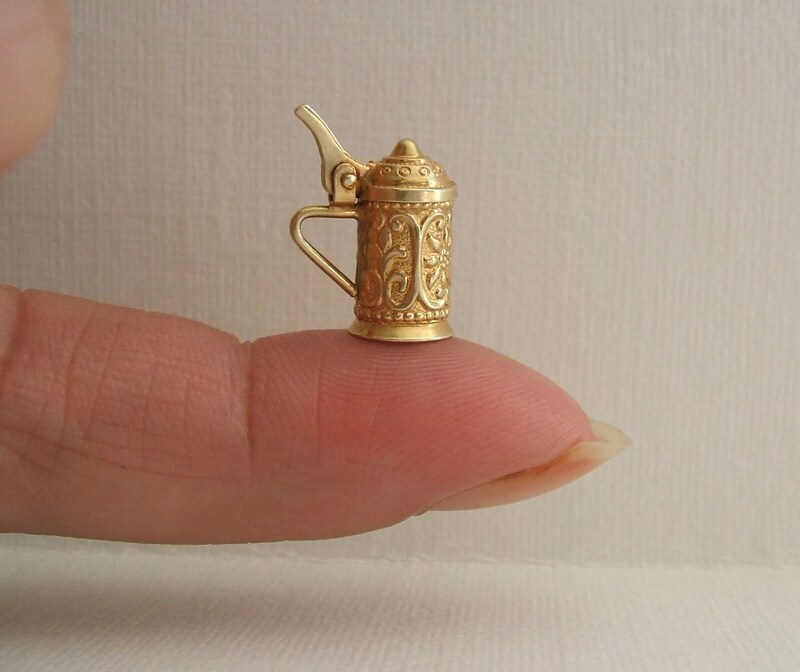 Mourning charms were charms that commemorated the dead. These included miniature portraits, locks of hair, jet carved charms (check out my post ‘A Lesson in Jet‘), lockets and any other items that represented the deceased. 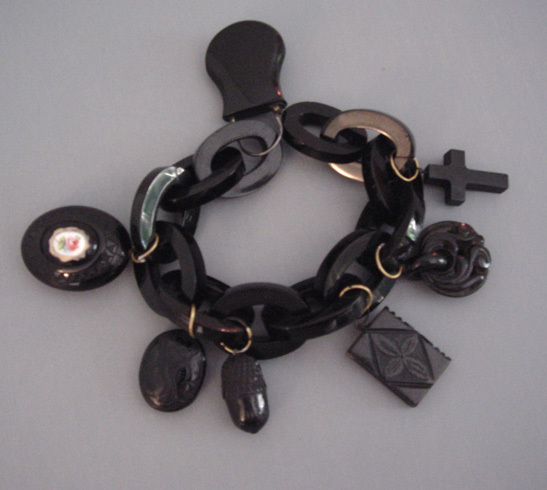 The Victorian mourning charms and bracelets are incredible. The craftsmanship, quality and beauty astounds. I wish I had one in my collection! During the Victorian period, articulated or mechanical charms were introduced. Articulated charms are charms which have a moving part. When you push a level or pull a chain, parts of the charm will move. 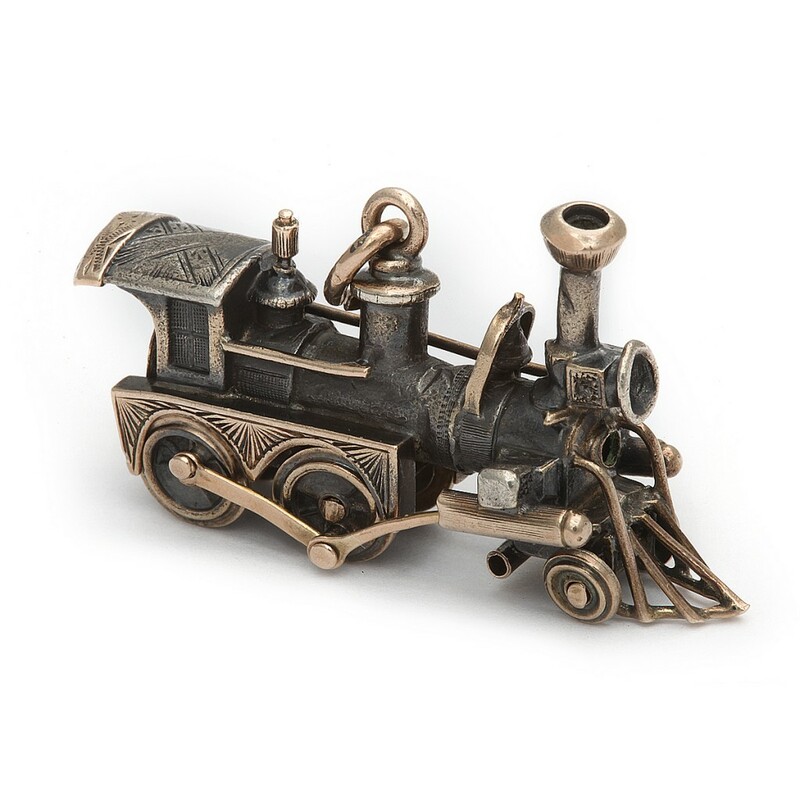 Victorian mechanical charms are one of the most highly collectible and sought after types of charms. During the 1920s to 1930s, diamonds, other precious stones and platinum were introduced to charm bracelets and charms. Charm bracelets of this era were very elegant and had become more angular looking, reflecting the Art Deco style. Geometric shapes were utilized with smooth lines and streamlined forms. Art Deco charm bracelets had sleek elegance and looked very sophisticated. 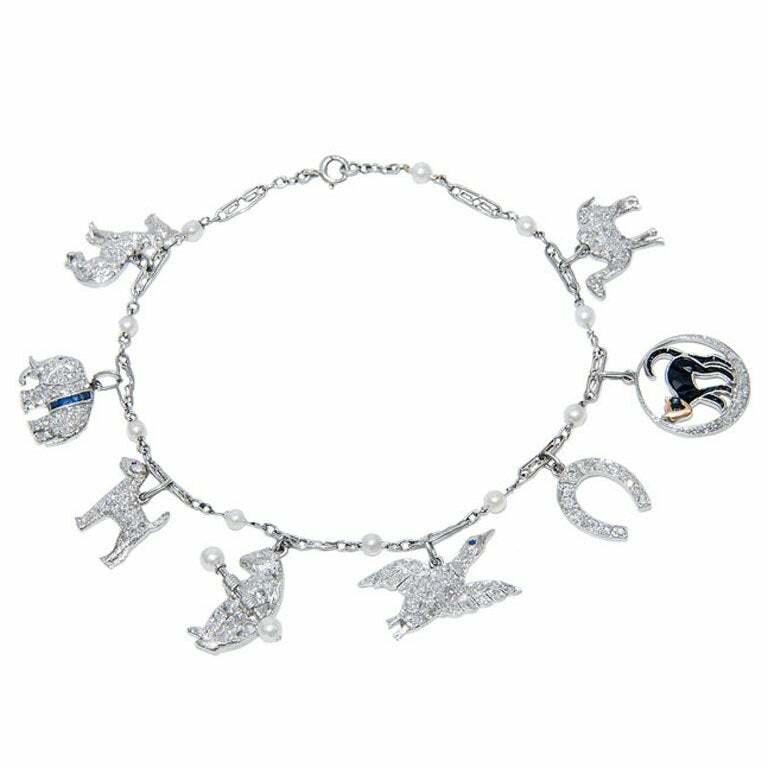 Let’s have a look at some gorgeous examples of charm bracelets of this era. I hope you’ve enjoyed ‘It’s a Charmed Life – Part 1’. Stayed tune for the second installment where charm bracelets of the 1940s and 1950s are explored; my favourite era! Ah! What an interesting series. I’ve always wanted to collect charm bracelets. I love the Victorian and Art Deco bracelets. Especially the little number with the diamonds and emeralds! Scrumptious. More, please! I’m looking forward to seeing your pieces from the 1950s. Enjoy the weekend! T.